During this busy summer season full of family activities and vacations, we undoubtedly find ourselves hearing our children say that they are “starving” when we are away from home and it is mealtime; or we are just too tired to cook after a day full of events. For the more health conscious of us, it seems like a no-brainer that there should be healthy fast food meals available. The “McHealthy” article is about two former McDonald’s executives and their efforts to build a new healthful, fast-casual dining concept set to launch next year, code named “Stephanie’s.” Although they have lofty ambitions, they also are moving slowly since history has not been kind to the idea of healthy fast food meals. At the end of the day, most people may say they want healthier fast-food, but that is not what they necessarily buy. Do you know of any successful healthy fast-food restaurants in your area that go beyond just a few healthy alternatives on the menu? If so, we’d like to hear from you! For those who submit, we’ll put you into a drawing for a Dr. Sears L.E.A.N. Start Kit, to include a parent’s guide, DVD, activity book and Dr. Sears’ NDD Book. Some caution, you might be thinking like we did that there are healthy fast food meals out there, i.e. Chipotle. However, while we applaud Chipotle for its fresh ingredients, you might be surprised to see how it compares to a Big Mac! Admittedly, as someone who spends his days focused on helping others avoid the pitfalls of poor nutrition, until reading this article and thinking about what I would consider healthy fast food meals, I was duped by the food marketing machine. Sad, given I am a former and repentant food marketer myself. So, even though I avoid fast-food with the exception of finding a healthy alternative on the menu in a pinch, I actually thought of Chipotle as a healthier alternative. 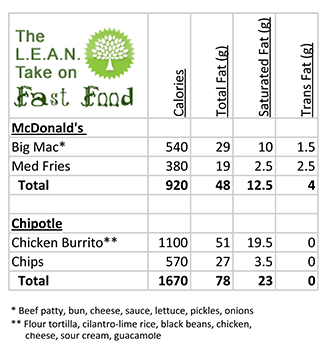 While I generally would skip the chips and split the burrito, I’d still be right there with a Big Mac in terms of calories and fat. And, for those occasions where hunger and taste get the best of me (they are good) and eat the whole burrito, it is a whopping 1,100 calories and 51 grams of fat. Ouch! I’m hoping Dr. Bill somehow skips this particular post. So, if an average person goes into a Chipotle and orders a burrito, chips and a soda, they likely will intake 2,000 calories, which is the average RDA for an individual. Perhaps, we really do need “McHealthy” offerings more than we think. But, buyer beware, read the fine print. We did find some health fast food meals and listed them below for you to use!